This novel has been on my TBR list for so long that when I saw it in Waterstones, I just knew I had to buy it. I love anything to do with mythical creatures - as anyone who's read my Cassandra Clare reviews will know - so I knew that just from the blurb that I would love it. And guess what? I really did. For me, The Iron King seemed a bit of a mixture between Alice in Wonderland, The Wizard of Oz, and Peter Pan. Meghan Chase, the story's heroine, has always been a bit different - but when she finds out that she's actually the daughter of a fearless faery king, she's kind of shocked (note that that is an understatement). 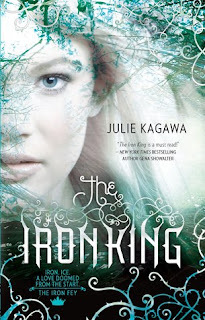 The Iron King follows Meghan's journey's through the Nevernever with her best friend, Puck, and the mysterious and handsome prince, Ash. Firstly, I loved the concept so so much. As I've grown older, my love for anything Disney and mythical has still stayed in tact, and although I have read books that spark this kind of imagination, for me, this held the depth that I've always been looking for. Kagawa really thought out the whole world of the Fae - it seemed so realistic, that I could just imagine that a trod was inside my own wardrobe. She managed to convince me of this surreal, parallel world in ways only the likes of J.K.Rowling and C.S.Lewis have ever managed to do - Kagawa has stepped into some big shoes, and if this first novel is anything to go by, she's just going to fill them more and more. The characters that Kagawa created were as equally as amazing as the initial plot. Okay, so Meghan did get ever-so-slightly on my nerves - she was a bit whiny but then again, she's just found out that her dad isn't actually her dad, and she is in fact a faery princess. So she wasn't too bad - but then you get onto the two heartthrobs Oh my. Yes, it is so sad to have book crushes on people, but let me tell you now that if you are attracted to males, then you will not be able to read this series without falling for either Ash or Puck - or both. Personally, I adored Ash. Kagawa's descriptions were incredible, and in my mind's eye I could actually visualize him. Puck was just as great - I had a sort of Peter Pan image for him, and I loved the relationship between him and Meghan - I found it incredibly realistic. And last but not least for the characters, I will get on to the monarchy. The Summer King and his wife were brilliant - I found them to be a bit of a more fierce version of Dumbledore and McGonagall. I thought their characterization was incredibly realistic in the sense that as I read parts containing them, I inwardly cowered back in awe and fear. You can feel their power through the pages. This also goes for both Queen Mab and the Iron King - they were incredibly powerful, and I truly believe that Kagawa is so talented for being able to convey the emotions to the reader like that. I don't think it's possible for anyone to read this and not feel those raw emotions coming out. I also liked the fact that the story was also partly woven into the history of literature - as in the fact that most of the fae were named after characters from A Midsummer's Nights Dream. But in the story, the character aren't just named after them - they are them, which again creates that sense that this magical land is just parallel to our own. And think about it - how cool would it be to find out that Shakespeare wrote a play about real, live faeries? Overall, I loved this novel so much. I don't think there is anything out there on the market like it, so I am thrilled that Kagawa has taken this opportunity and created such an amazing story. I don't have the next book, The Iron Daughter, currently on my shelf, and I have a big pile of books to get through first. But watch this space - I will be reading and reviewing this book hopefully quite soon. If you love anything to do with Disney and fairytales and mythical beings, then this is the book for you.